PAPERSOLDIERS JOURNAL: KOREAN BATTLESHIP 1592 "PANOKSEON"
The Korean Navy, during the Japanese Invasion 1592-1598 - played a huge role in containing the Japanese. Their most effective ship - alogside the Turtleship - was the Panokseon class. Panokseon ("board roofed" or "superstructured" ship) was an oar and sail propelled ship that was the main class of warship used by Joseon Korea during the late 16th century. The first ship of this class was constructed in 1555. 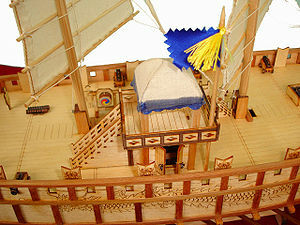 It was a ship made of sturdy pine wood, and was instrumental in the victories over the numerically superior Japanese Navy during the Japanese invasions of Korea (1592–98). Admiral Yi Sun-sin (1545–98) of the Joseon navy employed them alongside turtle ships during the war with great success. A key feature of a panokseon was its multiple decks. The first deck had non-combatant personnel, such as the rowers, who were positioned between the lower deck and the upper deck, away from enemy fire. The combatant personnel were stationed on the upper deck, which allowed them to attack the enemy from a higher vantage point. The panokseon also had a raised roofed observation platform where the commander stood. In line with the traditional structure of Korean ships, the panokseon had a U-shaped hull and a flat keel. This feature was due to the nature of the Korean coastal waters, which have a large tidal range and flat, expansive tidal plains. A flat keel enables a ship to sit comfortably on the tideland when the tide is out, after coming ashore or inside a wharf at high water. It also ensured greater mobility and a shallow draft and in particular allowed a ship to make sharp changes of direction at short notice. This panokseon was one of the main reasons why Admiral Yi was able to employ the Crane Wing formation at the Battle of Hansan Island with great success. 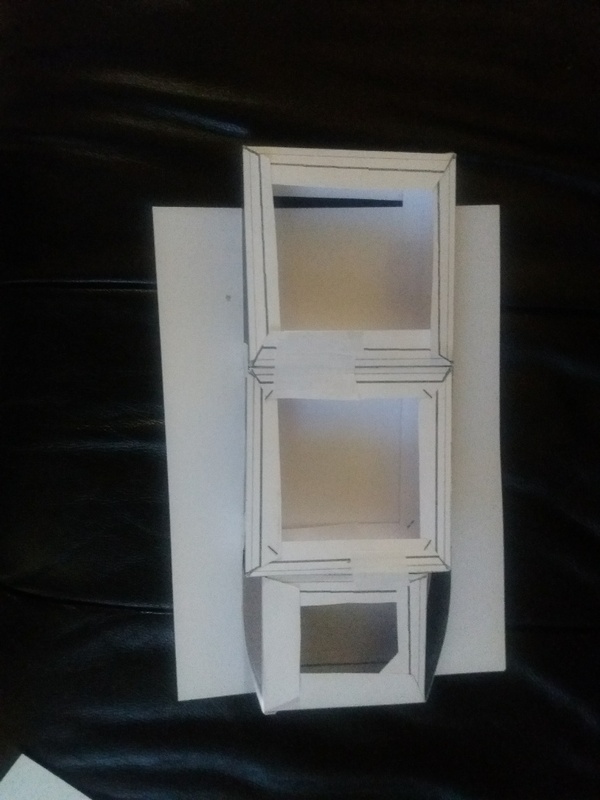 A model of panokseon centering on the commander deck. Panokseons were propelled by both sails and oars. Of the two basic types of sail, square and lateen, the square gives a strong performance downwind but struggles windward, whereas the fore-and-aft lateen excels against the wind, though requiring a large crew to handle it. In the West, square sails were used in the galleys of Ancient Greece and the Viking longships, and the fore-and-aft variety as early as the Mediterranean dromons of the Middle Ages. When the Age of Discovery began in the fifteenth century, multiple-masted ships equipped with both types of sails eventually appeared. In Korea fore-and-aft sail equipped ships had been in use since the eighth century. The panokseon and turtle ship therefore had two masts by default, and their position and angle could easily be managed so that the sails could be used in all winds, whether adverse or favorable. The ships had two to three levels stacked up on top of each other. By having multiple levels the rowers at the bottom were relatively safe, and marines at the top would have a height advantage over the enemy, firing down upon them and avoiding boarding of the ship. The upper deck had a tower in the middle of the ship that would be used for command and observation. The deck of the panokseon was broad and flat, making it ideal for the installation of cannons. Panokseons came in different sizes, the largest vessels estimated to range between 70 feet (21 m) and 100 feet (30 m) in length. The ship usually had 8 to 10 oars on each side, 50 to 60 oarsman and sailors and another 125 marines (i.e. fighting men). I decided to try to reproduce in paper one of them. 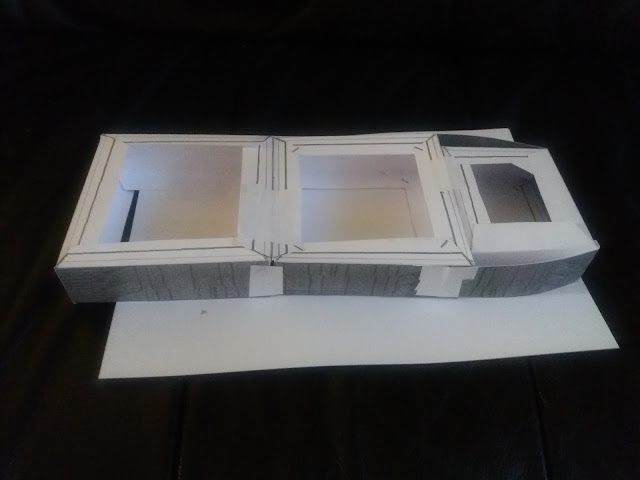 I've got on internet a paper model of this ship that actually I was not able to set up, and therefore I decided to try to build up one by myself, using some ideas of my own. 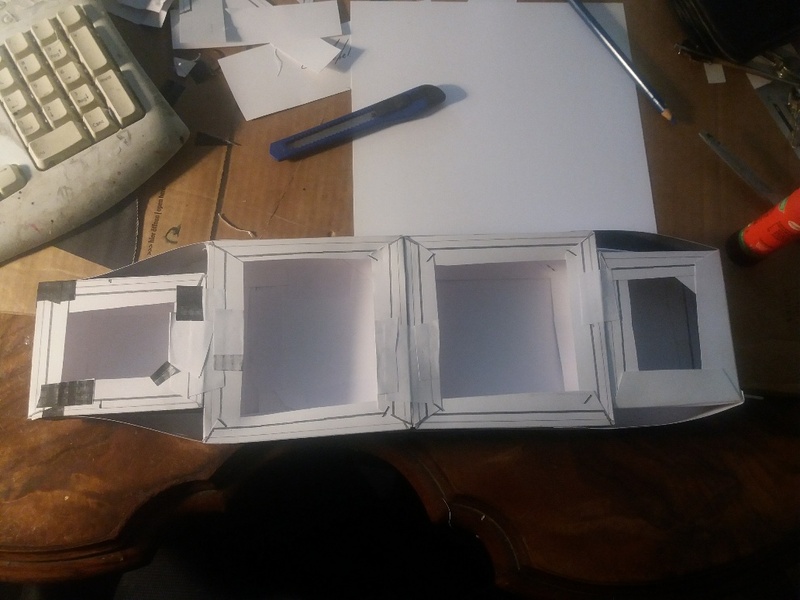 I started with 3 squares and 2 paper sheets to recreate the back of the ship.